NELIGH, Nebraska (CelebrityAccess) — Neil Young and Willie Nelson are set to headline a benefit concert to support the ongoing fight against the expansion of the proposed Keystone XL pipeline. Set for the afternoon of Sept. 27 on a farm near Neligh, Nebraska, the proceeds from the “Harvest the Hope” concert will benefit Bold Nebraska, the Indigenous Environmental Network and the Cowboy & Indian Alliance. The aforementioned organizations are united by their opposition to the Keystone XL Pipeline and their support of small, community-based clean energy projects. 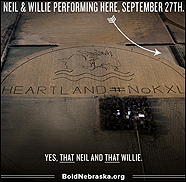 Also performing will be Native American hip-hop artist Frank Waln, Lukas Nelson and the “Stopping the Pipeline Rocks All-Stars,” a collective of local Nebraska artists who produced a benefit album to support the fight agaist the pipeline.